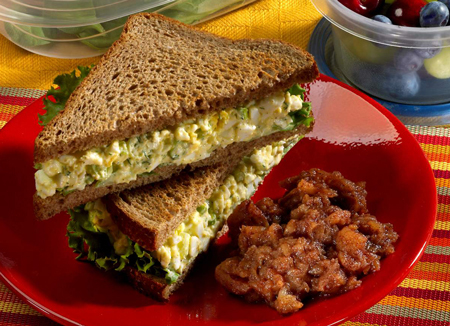 Make your egg salad sandwiches flat-belly friendly by replacing the mayonnaise with Greek yogurt. In this egg salad recipe for a flat-belly diet, gets the classic seasonings of dill, celery, and green onion — but a little lemon juice adds a some unexpected tang. Try serving egg salad over a bowl of lettuce greens. This sandwich pairs well with fresh berries as a side. In a medium pot, place the eggs and fill with water. Bring the water to a boil over high heat. Continue boiling for 5 minutes. Turn off the heat and cover, allowing the eggs to rest for 5 minutes. Pour off the water, and cover the eggs with ice for 5 minutes. Peel the eggs and place them in a medium bowl. Smash the eggs with a fork and stir in the yogurt until a chunky paste forms. Mix in the lemon juice and pepper to taste. Stir in the onion, celery, and dill until incorporated. Toast the bread, and serve the egg salad on the 2 slices of bread with 2 leaves of lettuce each. Per serving: Calories 262 (From Fat 85); Fat 9g (Saturated 3g); Cholesterol 317mg; Sodium 388mg; Carbohydrate 25g (Dietary Fiber 4g); Protein 19g.